Hidalgo Mayor Martin Cepeda and Reynosa Mayor Maki Esther Ortiz Dominguez walk in the middle of a procession headed to Plaza Principal during the Abrazo celebration Thursday, March 1, 2018, in Reynosa. REYNOSA — Mayors of neighboring border cities Hidalgo and Reynosa met at the halfway point between the bridge connecting their countries Thursday in a ceremonial gesture of goodwill dating back more than four decades. The abrazo — embrace or hug — on the Hidalgo-Reynosa International Bridge kicks off BorderFest each year and honors the relationship between the communities. Southbound traffic paused on the bridge as the dignitaries exchanged gifts and said a few words, while media jockeyed for a shot. The mayors said the event represents peace and focuses on what united them. BorderFest kicks off Friday at the State Farm Arena in Hidalgo and runs through Sunday. 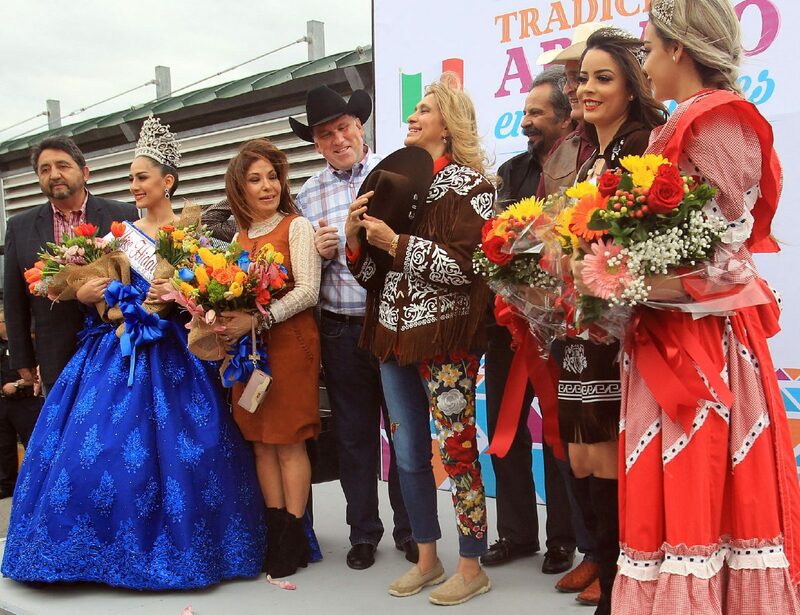 During the international celebration Thursday, musicians and dancers performed in the streets and plazas as Hidalgo Mayor Martin Cepeda and Reynosa Mayor Maki Esther Ortiz Domínguez walked arm in arm among a procession that made its way through the Mexican city. Flanked with armed guards in black and green, the delegation occasionally paused for performances. 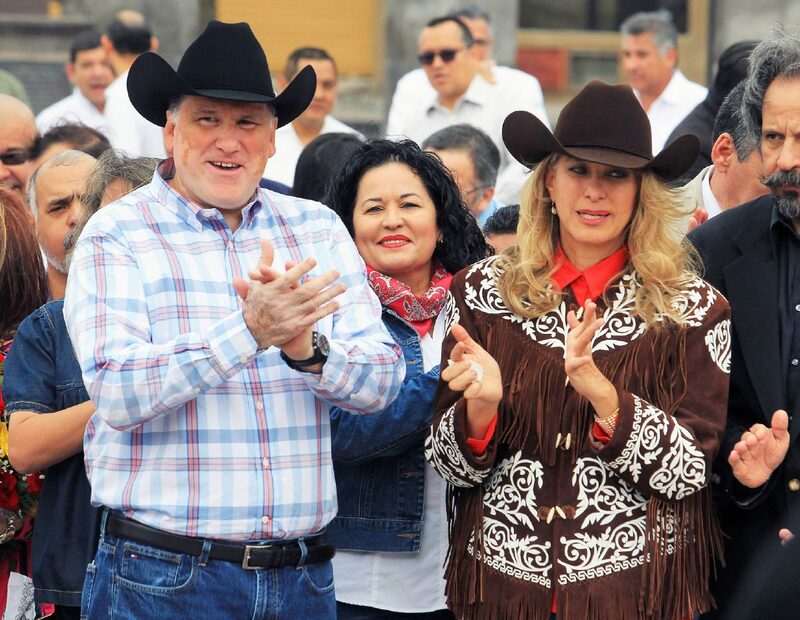 Reynosa Mayor Maki Esther Ortiz Dominguez smiles after receiving a cowboy hat from Hidalgo Mayor Martin Cepeda as they greet each other on the Hidalgo-Reynosa International Bridge during the Abrazo celebration Thursday, March 1, 2018, between Reynosa and Hidalgo. Hidalgo Mayor Martin Cepeda and Reynosa Mayor Maki Esther Ortiz Dominguez applaud as dancers perform at the Plaza Las Americas near the Hidalgo-Reynosa International bridge during the Abrazo celebration Thursday, March 1, 2018, in Reynosa. 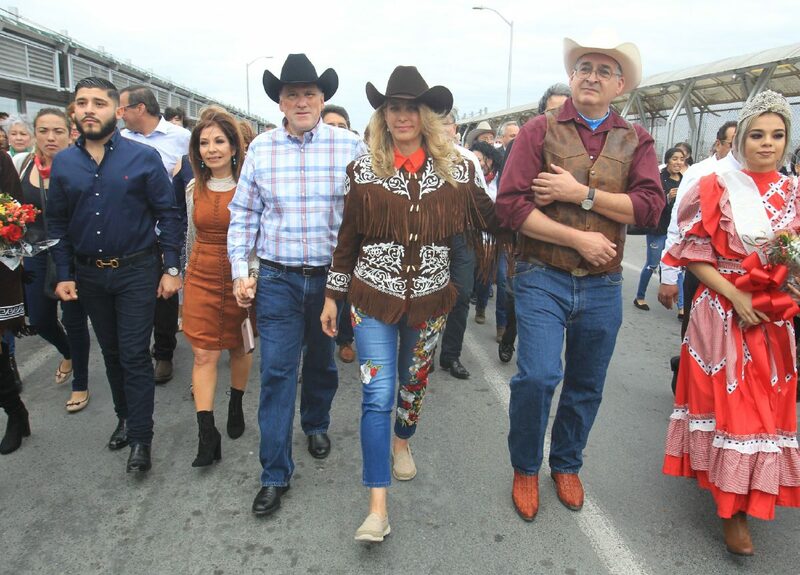 Hidalgo Mayor Martin Cepeda and Reynosa Mayor Maki Esther Ortiz Dominguez walk together across the Hidalgo-Reynosa International Bridge during the Abrazo celebrations Thursday, March 1, 2018, between Reynosa and Hidalgo. 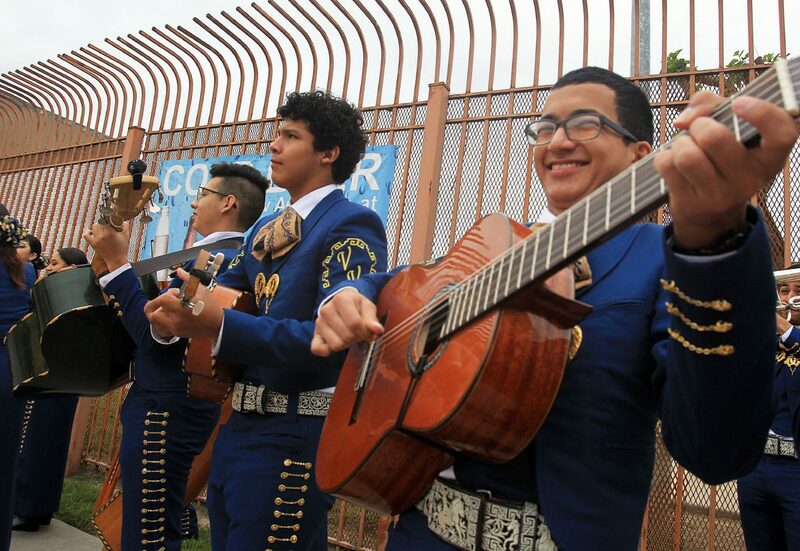 Mariachi musicians from Valley View High School perform near the Hidalgo-Reynosa Bridge during the Abrazo celebrations Thursday, March 1, 2018 in Hidalgo. 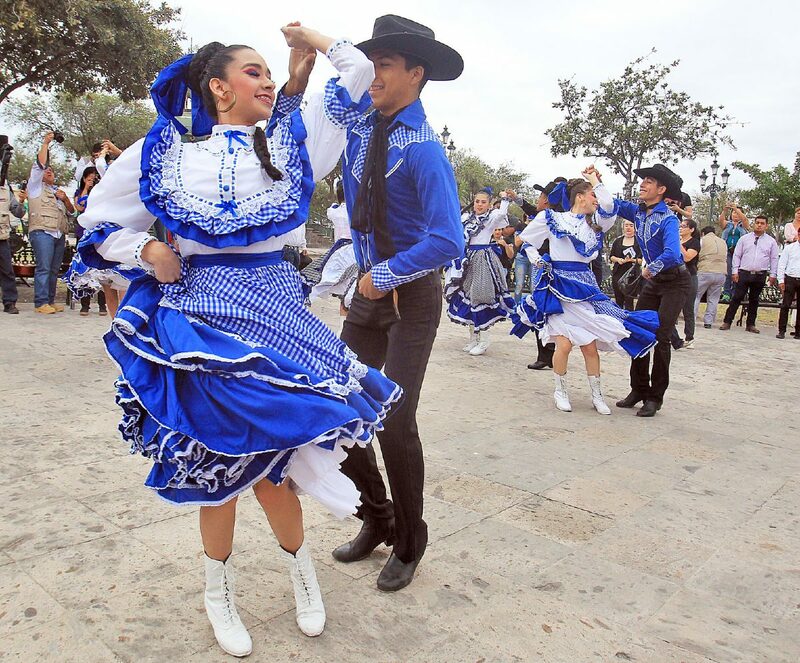 Members of Baile Folklorico de Universidad Tamaulipas perform for attendees at the Plaza de Americas near the Hidalgo-Reynosa International Bridge during the Abrazo celebrations Thursday, March 1, 2018, in Reynosa. 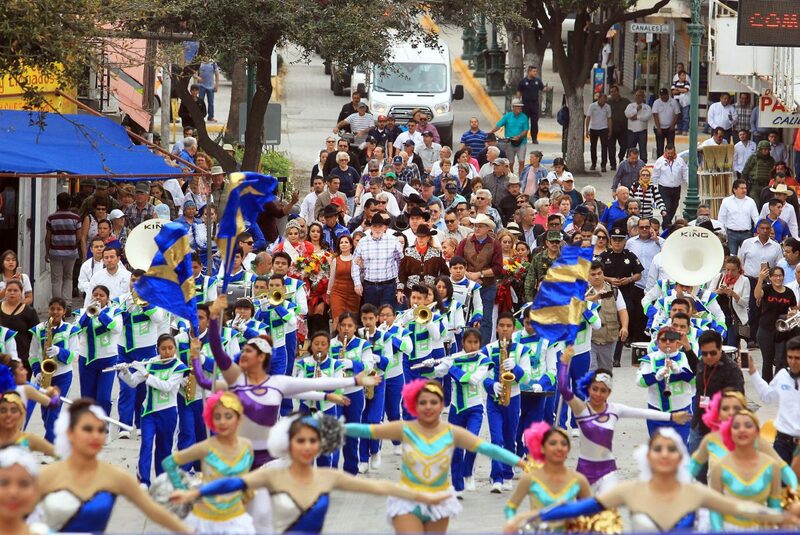 The group marched to the Reynosa square where a large tent, more performers and catering awaited the visitors. “We share families, culture, traditions, stories, businesses — this is how it’s always going to be, there is no wall that can compete with the efforts of human beings,” the Reynosa mayor said to reporters in Spanish at a celebration near Parroquia de Nuestra Señora de Guadalupe in Reynosa. Politicians took the opportunity to stress the importance of their bond. Officials introduced themselves and welcomed Winter Texans while servers delivered mixed drinks. Canadian Dennis Shelston was among a handful of seasonal residents that walked with the parade. Shelston said he attended because he heard about the meeting between allies. “It makes you wonder why there needs to be a wall if there’s so much friendship,” he said.